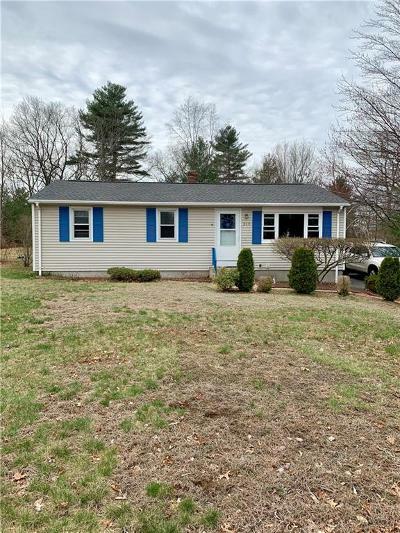 Stunning move in ready single level ranch in desirable Burrillville. Open concept kitchen with newer appliances including dishwasher, stove and refrigerator. Freshly painted interior with ceramic tile floors in kitchen. Updated bathroom with newer vanity and crown molding. Brand new carpeting in all 3 bedrooms. Roof is 1 year old with only 1 layer. Fully finished basement with large bar area to start those summer parties. Living area also in lower level with private storage area and utility closet. Very large backyard with fire-pit area. House sits on an almost 1/2 acre lot! Subject to seller finding suitable housing.